At a time when whole exome sequencing was not yet available, the diagnosis of sporadic diseases required a candidate gene approach. 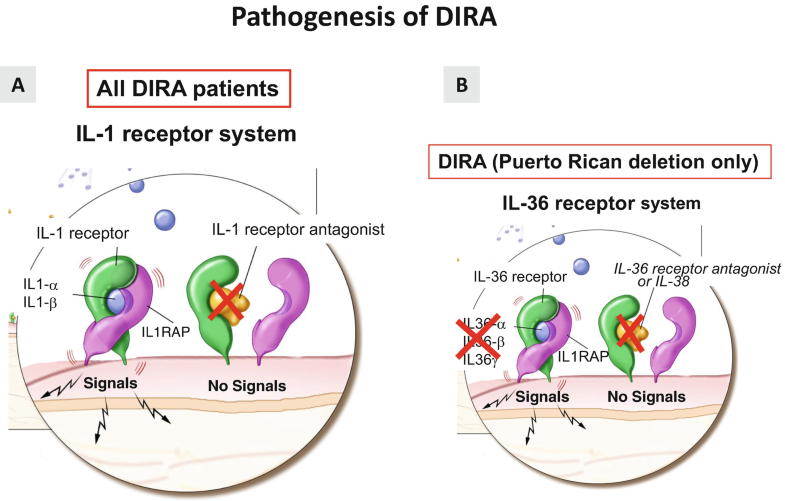 DIRA was in fact discovered in two patients who had complete responses to empirically administered IL-1 blocking treatments with recombinant IL-1 receptor antagonist, anakinra, which strongly suggested an IL-1-mediated disease, and resulted in a candidate screen of genes in the IL-1/inflammasome pathway that eventually led to finding “the needle in the haystack” (Reddy et al. 2009; Aksentijevich et al. 2009). Historic descriptions of patients with pustulosis and sterile bone lesions point to a pathogenic connection between neutrophilic pustulosis and osteomyelitis. However, the majority of these patients do not have IL1RN mutations, and most are not monogenic. These conditions are referred to as chronic recurrent multifocal osteomyelitis (CRMO), a group of autoinflammatory bone diseases that also include the monogenic disease Majeed syndrome (Stern and Ferguson 2013). Two historical descriptions of patients who likely had DIRA illustrate the poor outcomes of young undiagnosed patients who are not receiving IL-1 blocking therapies (Leung and Lee 1985; Ivker et al. 1993). In 2009, two groups led by Verbsky and Goldbach-Mansky identified a homozygous 175-kb deletion in two patients of Puerto Rican descent who presented with systemic inflammation, pustulosis, and aseptic osteomyelitis. The deletion on the long arm of chromosome 2 included the locus for IL1RN as well as five adjacent genes; all are agonists and antagonists of the IL-36 receptor (encoded by IL1RL2). The IL-36 receptor agonists are IL36A, IL36B, IL36G, and the IL36RN which encodes the IL-36 receptor antagonist (IL-36Ra), and IL38 encodes the second IL-36 receptor antagonist, IL-38 (Reddy et al. 2009; Aksentijevich et al. 2009) (Fig. 1). The latter group also found damaging mutations affecting IL1RN exclusively, thus confining the clinical phenotype to complete loss of function of IL1Ra, the protein encoded by IL1RN (Aksentijevich et al. 2009). Eleven different disease-causing mutations in IL1RN in 22 patients with DIRA have been reported to date (Mendonca et al. 2017; Kuemmerle-Deschner et al. 2018; Schnellbacher et al. 2013; Infevers 2019). These include five nonsense mutations, one in-frame deletion, three frameshift deletions, the genomic 175-kb deletion on chromosome 2, and a recently reported 22-kb deletion in an Indian patient with DIRA (Reddy et al. 2009; Aksentijevich et al. 2009; Mendonca et al. 2017; Stenerson et al. 2011; Ulusoy et al. 2015; Jesus et al. 2011; Schnellbacher et al. 2013; Altiok et al. 2012; Kuemmerle-Deschner et al. 2018; Infevers 2019). Most mutations identified are thought to be rare founder mutations in the Netherlands, Newfoundland (Aksentijevich et al. 2009), Puerto Rico (Reddy et al. 2009; Aksentijevich et al. 2009; Schnellbacher et al. 2013), Brazil (Jesus et al. 2011), India (Mendonca et al. 2017), Turkey (Altiok et al. 2012; Ulusoy et al. 2015; Infevers 2019) and Germany (Kuemmerle-Deschner et al. 2018). DIRA is caused by loss-of-function mutations in IL1RN, which encodes the endogenous interleukin-1 (IL-1) receptor antagonist (IL1Ra). Most of the DIRA-causing mutations are nonsense or frameshift mutations that lead to either no expression of protein or to expression of truncated nonfunctional protein, IL-1Ra. Loss of IL-1Ra results in unopposed IL-1 action leading to escalation of IL-1-driven systemic and organ-specific inflammation involving the skin and bone (Fig. 1). DIRA presents in early childhood with marked skin and bone involvement and systemic inflammation with elevation of acute-phase reactants. The age of onset is around 2 to 2.5 weeks of life. DIRA skin manifestations are characterized by perinatal-onset pustular dermatitis resembling pustular psoriasis (Fig. 2a–c). Nail changes in the form of onychomadesis (splitting of the nail bed) and nail pitting can also be seen. Inflammatory bone disease includes osteomyelitis of ribs with rib widening (Fig. 2e), periostitis affecting several long bones, and multifocal osteolytic lesions (Fig. 2d) (Aksentijevich et al. 2009). Sequela of sterile osteomyelitis includes odontoid destruction leading to atlantoaxial joint instability and requiring cervical spine surgery, kyphotic deformities in the form of gibbus formation from vertebral collapse from vertebral osteomyelitis (Fig. 2f), and limb length discrepancy. Osteopenia and osteoporosis are other common findings in untreated patients. Untreated patients could have a hypercoagulable state manifesting in the form of deep vein thrombosis or thrombosis at the catheter site, CNS vasculitis, or vasculopathy. Carotid arteritis has also been seen in one patient of Puerto Rican descent. Leukocytosis, thrombocytosis, and elevated acute-phase reactants are present with active disease (Aksentijevich et al. 2009). Anemia can be severe requiring blood transfusions in untreated patients. If available, the absence of IL-1 receptor antagonist by ELISA can aide in making a diagnosis, as endogenous serum IL-1 receptor antagonist levels are undetectable in DIRA (serum needs to be assessed before initiation of treatment with recombinant IL-1 receptor antagonist, anakinra). The severity of escalating inflammation in an infant in critical condition with a clinically suggestive phenotype should prompt empiric treatment with an IL-1 blocking agent rapidly. A rapid response to a therapeutic challenge with the short-acting IL-1 receptor antagonist, anakinra, can be diagnostic. The diagnosis of DIRA is made based on clinical features as treatment should be started in patients with a suspicion of DIRA even before a genetic diagnosis is made. However, detection of mutations in IL1RN is mandatory for a definitive diagnosis. Specific primers that facilitate the identification of two founder mutations, 175-kb deletion described in two Puerto Rican patients and a the recently described homozygous 22-kb deletion found in an Indian patient, are published and can aid in making a diagnosis (Aksentijevich et al. 2009; Mendonca et al. 2017). Rapid response to treatment with recombinant IL-1Ra, anakinra, validates the key role of IL-1 in causing the severe phenotype of DIRA. IL-1 blockade with anakinra results in complete disease remission (Fig. 3) (Reddy et al. 2009; Aksentijevich et al. 2009; Jesus et al. 2011). One report used canakinumab, targeting IL-1β only (Ulusoy et al. 2015). Given the fact that IL-1 receptor antagonist, anakinra, which is recombinant IL-1 receptor antagonist, antagonizes IL-1α and IL-1β, treatments that would restore the IL-1α and IL-1β blocking activity have historically been used. While anakinra causes complete remission, a recent pilot study of six DIRA patients using the longer-acting soluble IL-1 receptor molecule, rilonacept, maintained patients with DIRA in clinical remission by providing sustained control of symptoms and inflammatory markers. The weekly injections of rilonacept were preferred over the daily anakinra injections (Garg et al. 2017). The prognosis of untreated patients with DIRA is historically poor. So far, no adult patients who are homozygous for the disease-causing mutations have been identified. The mortality of untreated DIRA based on published reports is over 25% and occurred at 2, 4, and 21 months and 9.5 years of age. One case of intrauterine demise at 27 weeks of gestational age has also been reported (Aksentijevich et al. 2009; Altiok et al. 2012). In families with an affected child, and in populations where DIRA has been reported, genetic counseling and testing should be recommended. If both patients carry a heterozygous mutation, they have a 25% chance of having an affected child. Prenatal diagnosis can be made through diagnostic techniques like chorionic villous sampling or amniocentesis.